Most children are upset, frightened, or anxious the first few days of school. Having experience with a summer course can make a child less likely to display those emotions and more likely to remain calm and focused. This gives children a chance to participate in a socially engaging environment. They will become comfortable in such a setting before Kindergarten even begins. Reading can be a fun adventure for children. It introduces them to a whole new world. Kindergarten teachers have amazing reading tips that can develop a child’s interest in reading. Reading will get children ready for school. The reading tips they learn at Kindergarten will come in handy, as it will be a daily activity at school. School is usually the first time children experience a routine schedule of their own from day to day. It can take a little while for kids to make adjustments and adapt to an every day schedule. A summer session will not only introduces the routine to children, but will allow them to make those adjustments before entering Kindergarten. Until they reach school age, children usually wake up whenever they want, and very few of them are likely to take a nap at the same time. A summer course will assist in giving the child a more definitive sleep schedule. For most kids, other than their parents, a teacher is the first person of authority they meet. Counting, the alphabet, and more will be taught to prepare the kids for Kindergarten. This is a nice head-start for the child as well as the teacher. For many children, school is the first time they are able to interact with other kids in their own age. This can lead to some awkward times as children with siblings will try to establish a ‘pecking order’. Others may try to be more reserved if they are an only child. Why not let them work out the awkwardness during the summer? It will allow the kids more comfort when they enter Kindergarten. Of course, this and the previous one on our list go hand in hand. Learning respect and being courteous to others is still noteworthy. Both are characteristics the children will apply to everyone they meet, not just other kids of the same age. Patience is embedded in sharing and taking turns, and patience is a virtue. Better to learn and develop patience as early as possible, right? Getting into the habit of listening and focusing on everything being said is another great characteristic. The sooner a child develops this skill, the better. Give your child’s summer enrichment by filling it with activities. Guess what? A summer school session will do exactly that. The last on the list may be the best. A summer program like Kindergarten prep will also create things for parents to talk about with their child. It gives parents a chance to provide positive reinforcement to the child for their effort and successes over the summer. 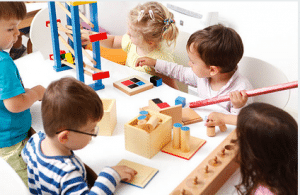 Stressing about Kindergarten can take the fun out of an enjoyable experience. Whether or not you’re sure how to prepare your child for Kindergarten, consider enrolling your child in a summer school enrichment program. The benefits are tremendous and everyone comes out winning in the end, especially the children.